It can be confusing to know what you should be eating in your marathon training diet when there is just so much advice and contradictory diets and research and evidence. However it all comes down to what your goals are. For example, if you are wanting to lose weight, your diet will be different than if you are trying to reach your peak performance in the marathon. No one diet will be perfect for everyone. Also, no one diet will be perfect for you at all phases of your life. As you goals, health, and exercise patterns change so should your diet. This is important to keep in mind! So I want to talk to you about what your marathon training diet should look like if you are in training for a half or full marathon coming up! There is so much to talk about concerning your marathon training diet when you are training which is why I put everything together in the EAT LIKE A MARATHONER Nutrition Course which is a fast paced course but one that will leave you very knowledgeable on the topic of eating while training for a marathon + creating a personal nutritional plan in the weeks before, during, and after your marathon. I want to give you the framework though right here and now though! 2. Eat fruits and vegetables at every meal. It is a fact that we are not eating enough fruits and vegetables. We should be eating about 5-9 servings every day! This can be difficult for a lot of people but we need to make the effort. One of the simplest ways to make sure we are eating enough fruits and veggies is to eat one of each at every meal. So when you sit down for breakfast, lunch or dinner, include some sort of fruit and vegetable on your plate. If you eat 3 meals a day you will then get 6 servings of fruits and vegetables. Score. 3. Lots and lots of water. As runners we lose a lot of water when we are out running, sweating, and burning through energy. Dehydration is no joke. We need to make sure we are always hydrating. Figure out a way to keep yourself motivated to drink whether it's buying yourself a 32 oz water jug that you refill twice a day or putting lemon wedges or strawberry slices in your water to make it more appealing. 4. A great energy drink that is at least comprised of 4-8% carbohydrates. When you are training for a marathon and performing longer and longer runs you will need to bring some sort of carbohydrate drink or snack with you on runs over and hour in length. The best form is through an energy drink that contains carbs and electrolytes. Not all energy drinks though are created equal and there are some poor choices out there on the market. Here is a rundown of some of the best out there (including the one Meb Keflezighi uses and swears by) and some to just say no to. 5. Includes protein as a recovery nutrient and not a base. There is a huge hype over eating tons and tons of protein. Sure it's incredibly beneficial and a key macronutrient however there is a limit to how much we need since we can eat too much! (The EAT LIKE A MARATHONER Nutrition Course actually personalizes your macronutrient needs towards your body and how often you are running through a series of calculators so that you know exactly how much you need!) As a long distance runner though you actually do not use protein (almost at all!) as energy for your running. It does help in any muscle repairs that you might need after a long run but as far as being capable of running the marathon it's use is almost negligible. Therefore think of it in terms of recovery food but not vital for eating before your long runs. 6. Eat healthy fats! Fats is an essential macronutrient that you need to intake every day as part of your marathon training diet. Healthy fats boost brain power and also help you to perform many bodily functions. It also will be the macronutrient that you will use for your energy during your marathon if you do run out of carbohydrates. However you need to eat the good fats! That is fish, nuts, seeds, and olive oils! So there you have it. The framework that your marathon training diet should consist of. If you find yourself lacking in certain areas figure out a way right now to make it a bit easier to eat better! Just one simple step versus many bigger steps will be incredibly effective in getting on the right track. Challenge yourself to drink 8 glasses of water each day for a month. Eat a fruit OR vegetable (to start with) at every meal for a week. Then add in a fruit AND vegetable at every meal for a month. Set a timer on your phone or add it onto your calendar to supplement with Vitamin C a couple days before and after a long run. Make your own trail mix with almonds, cashews, pumpkin seeds, raisins, craisins, and coconut for a healthy filling snack of healthy fats! Restock it every week so that you are ready with it! 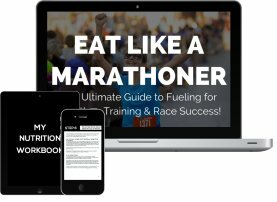 Get the EAT LIKE A MARATHONER Nutrition Course so that you figure out your exact macronutrient needs and learn why and how marathoners should eat. 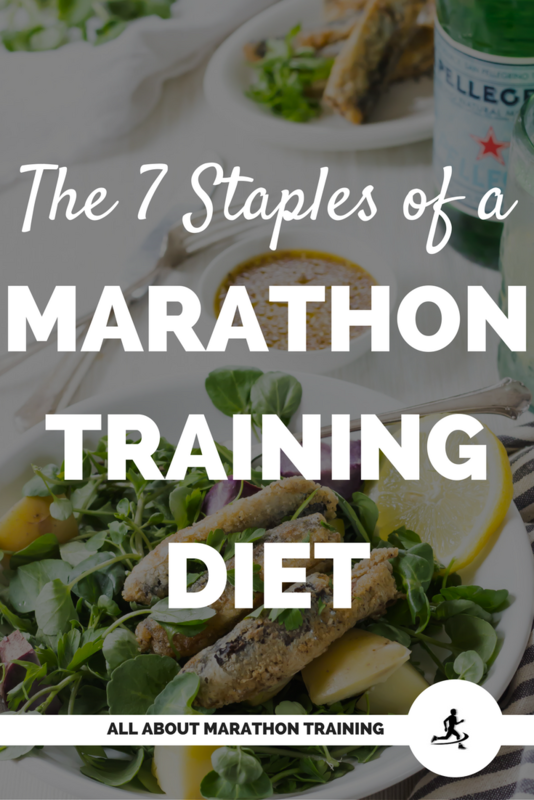 + Get meal ideas and more marathon training diet tips just like these! + you will develop your personal marathon nutrition plan through the 9 STEP Nutrition Plan to implement before your marathon. You will learn things like how many carbs YOUR body can store, what mile YOU will hit the wall at, how to avoid that through your own personal carbo-loading plan and race refuel plan. The information through the calculators will give you so much insight!